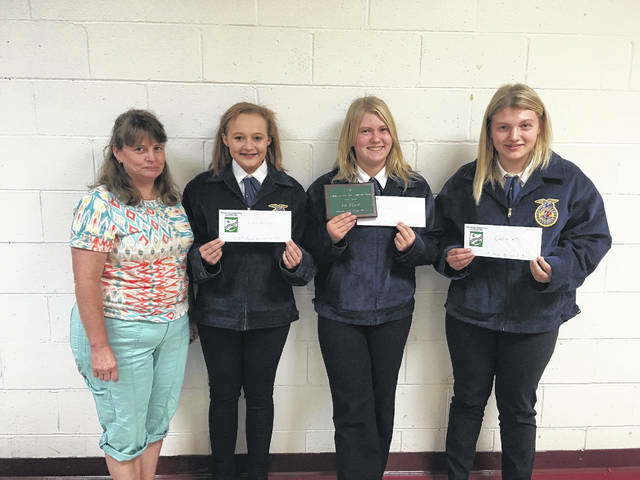 Southern High School FFA students Caelin Seth, Kristen McKay, and Ciera Whitesell were recognized as first, second and third place participants in the Agricultural Land Judging Competition held in September near New Marshfield. The top scoring team was from Southern and included Seth, McKay, Whitesell, and Riley Holding. Shown are, from left: Meigs SWCD education coordinator Jenny Ridenour, Whitesell, McKay, and Seth. 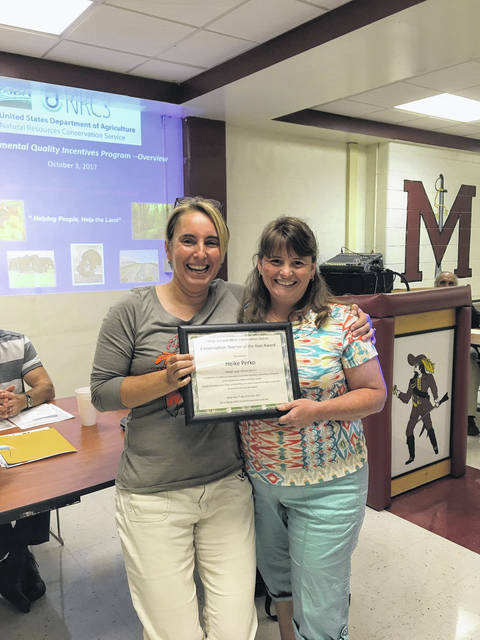 Heike Perko, left, eighth-grade science teacher at Meigs Middle School, was honored as the inaugural Meigs SWCD Conservation Teacher of the Year at last week’s Meigs SWCD annual banquet and meeting. She is shown with Meigs SWCD education coordinator Jenny Ridenour. Bryan White, Coolville, center, was recognized as the 2017 Meigs SWCD Cooperator of the Year at the Meigs SWCD annual banquet and meeting on Oct. 2. He is shown with Carrie Crislip, USDA-NRCS district conservationist for Meigs County, and Joe Bolin, president of the Meigs SWCD Board of Supervisors. 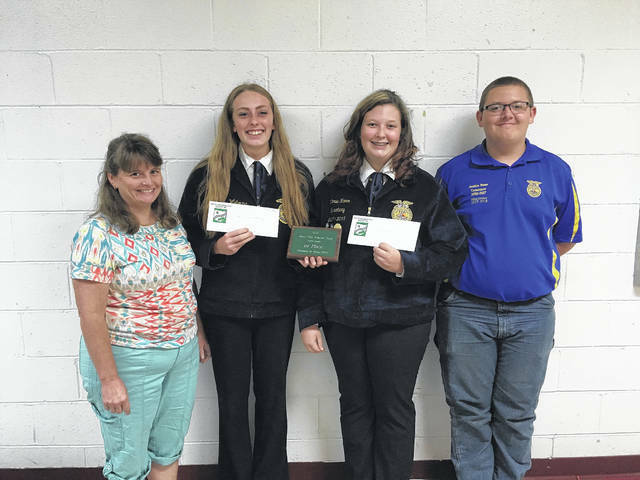 Southern High School FFA students Valerie Hamm and Dominique Wehrung were recognized as first and second place, respectively, as high-scoring individuals in the Urban Land Judging Contest held last month in Athens County. Taking third place was Jacob Jordan, Meigs High School FFA (not pictured). The top scoring team was from SHS and included Valerie Hamm, Wehrung, Colton Hamm, and Austin Rose. Shown are, from left: Meigs SWCD education coordinator Jenny Ridenour, Wehrung, Valerie Hamm, and Rose. POMEROY — While many people see drones, formally Small Unmanned Aerial Vehicles or SAUVs, as nuisances, they have many uses in agriculture, first response and engineering. That was according to John Bentz, Racine, who gave a presentation, “The View from Above, the Use of Unmanned Aircraft Systems in Everyday Life,” at this year’s annual Meigs Soil and Water Conservation District’s annual meeting and election, which was held Tuesday, Oct. 3 at Meigs High School. Bentz, a civil engineer employed with Pickering Associates and a Federal Aviation Administration-certified drone pilot, stressed the importance of drone operators to be responsible and respectful of other people, and drew a distinction between recreational users and commercial users, who are regulated by the FAA. Recreational rules include flying no higher than 400 feet and keeping the drone in sight at all times. In addition they are not allowed to fly near airports and over people or sporting events. “Drones are becoming very much a part of our society whether we like it or not,” Bentz explained, citing a study from 2012 that erroneously estimated by the year 2020 there would be approximately 30,000 drones in operation. That 30,000 figure was too low; since then that number has been revised to 7 million drones by 2020. The number of hobby and commercial drones is currently estimated around 2 million. Bentz showed one of his drones, a brick-sized DJI Mavic Pro, which can fly up to 40 miles-per-hour out to 4.3 miles from the operator. It can also attain an altitude of 3.1 miles (but is limited by FAA rules to 400 feet), and has a battery life of 27 minutes. That particular drone includes several safety features including obstacle avoidance and a “return-to-home” feature. He explained how agricultural producers can also use drones and associated software for a variety of purposes from determining the fertility and successful growing rate of crop fields, to simply counting the cows in the back 40 without ever leaving the house. First responders and others are also using drones, which can be deployed quickly and up to 400 percent cheaper than helicopters. Other relevant uses include mapping and engineering including bridge and tower inspections. Again he stressed the need for operators to responsible and respectful of other people. “Drones can be a nuisance, but they have advantages… you will be seeing their capabilities and use expanding farther and farther,” Bentz concluded. Heike Perko, New Marshfield, was recognized as the inaugural Conservation Teacher of the Year. The award was announced by Meigs SWCD education coordinator Jenny Ridenour, who said to be considered for this award, a teacher must have demonstrated commitment to conservation education by long-time cooperation, practice, service or education. Perko, the eighth-grade science teacher at Meigs Middle School, takes her students outside and hikes, conducts biological and chemical stream studies, and started an outdoor garden, Ridenour said. She also wrote many grants to give her students additional opportunities to study and learn out-of-doors, and started an afternoon garden club, which was a huge success. She started at Meigs Local as the Talented and Gifted teacher at Meigs Intermediate School, and was also a fourth-grade science teacher. Perko is also a member of the Raccoon Creek Partnership and assisted with the Meigs SWCD Rain Barrel Workshop last year. Bryan White of Coolville and Cool Country Farms was named the 2017 Meigs SWCD Outstanding Cooperator. Carrie Crislip, United States Department of Agriculture-Natural Resources Conservation Service district conservationist for Meigs County, cited White’s long-time cooperation with the NRCS and the Meigs SWCD dating back to 2007. Using multiple agreements with the NRCS, White has completed numerous projects including improved grazing operations, access roads, subsurface drainage, watering facilities, heavy use pads, fencing (including fencing cattle out of ponds), and finally the completion of a Comprehensive Nutrient Management Plan. Crislip also gave a brief update on Environmental Quality Incentives Program projects for Fiscal Year 2017. Twelve contracts for $113,288.31 were obligated in the following areas: Southern Ohio Appalachian Outreach (1), High Tunnel Systems (2), Oak Management in the Appalachian Mountains (5), Pasture Improvement (1), Limited Resource Farmer (2), and Beginning Farmer (1). Obligations for the past five years totaled $435,506.83, Crislip said. David Bright representing the Athens-Meigs Farm Bureau announced that the Farm Bureau will begin holding its annual meetings and elections in conjunction with the respective county SWCDs. The Farm Bureau will hold its annual meeting with the Meigs SWCD on even-numbered years, and with the Athens SWCD on odd-numbered years. Each year the Meigs SWCD sponsors a county-wide soil judging contest for Vocational Agriculture students. This is held in conjunction with the Athens SWCD, and this year’s contest was held in Athens County at the Brooks Farm near New Marshfield. Nine students from Southern Local participated as well as eight students from Meigs Local. Top-scoring teams and individuals were recognized at the banquet. High-scoring individuals in the Agricultural Judging Contest were: in order, Caelin Seth, Kristin McKay, and Ciera Whitesell, all from Southern. The top-scoring team was from Southern and included Caelin Seth, Kristin McKay, Ciera Whitesell, and Riley Holding. High-scoring individuals in the Urban Judging Contest were, in order: Valerie Hamm (Southern), Dominique Wehrung (Southern), and Jacob Jordan (Meigs). The top-scoring team was from Southern and included Valerie Hamm, Dominique Wehrung, Colton Hamm, and Austin Rose. Cody Hacker, program specialist for the Ohio Department of Agriculture — Division of Soil and Water Conservation, announced that Meigs SWCD Board of Supervisors Keith Bentz and Tonja Hunter, both of Racine, were re-elected to three-year terms on the Meigs SWCD Board of Supervisors commencing January 2018. The Meigs SWCD, established in 1943 is a legal subdivision of state government that provides natural resource management assistance to county landowners and other units of local government. The district is funded by the Meigs County Board of Commissioners, and county funds are supplemented by funding from the Ohio Department of Agriculture. The district is governed by a five-member board of supervisors, all county residents. Board members serve staggered three-year terms. Current supervisors also include: Bill Baer, Racine; Joe Bolin, Rutland; Tonja Hunter, Racine; Keith Bentz, Racine, and Tony Carnahan, Syracuse. https://www.mydailysentinel.com/wp-content/uploads/sites/14/2017/10/web1_AG-LAND-JUDGING201710910216609.jpgSouthern High School FFA students Caelin Seth, Kristen McKay, and Ciera Whitesell were recognized as first, second and third place participants in the Agricultural Land Judging Competition held in September near New Marshfield. The top scoring team was from Southern and included Seth, McKay, Whitesell, and Riley Holding. Shown are, from left: Meigs SWCD education coordinator Jenny Ridenour, Whitesell, McKay, and Seth. https://www.mydailysentinel.com/wp-content/uploads/sites/14/2017/10/web1_CONSERVATION-TEACHER-OF-THE-YEAR2017109102112140.jpgHeike Perko, left, eighth-grade science teacher at Meigs Middle School, was honored as the inaugural Meigs SWCD Conservation Teacher of the Year at last week’s Meigs SWCD annual banquet and meeting. She is shown with Meigs SWCD education coordinator Jenny Ridenour. https://www.mydailysentinel.com/wp-content/uploads/sites/14/2017/10/web1_COOPERATOR-OF-THE-YEAR2017109102117817.jpgBryan White, Coolville, center, was recognized as the 2017 Meigs SWCD Cooperator of the Year at the Meigs SWCD annual banquet and meeting on Oct. 2. 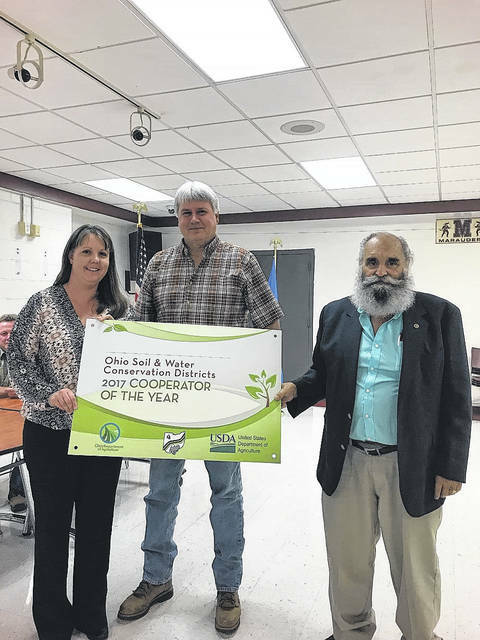 He is shown with Carrie Crislip, USDA-NRCS district conservationist for Meigs County, and Joe Bolin, president of the Meigs SWCD Board of Supervisors. https://www.mydailysentinel.com/wp-content/uploads/sites/14/2017/10/web1_URBAN-LAND-JUDGING201710910212187.jpgSouthern High School FFA students Valerie Hamm and Dominique Wehrung were recognized as first and second place, respectively, as high-scoring individuals in the Urban Land Judging Contest held last month in Athens County. Taking third place was Jacob Jordan, Meigs High School FFA (not pictured). The top scoring team was from SHS and included Valerie Hamm, Wehrung, Colton Hamm, and Austin Rose. Shown are, from left: Meigs SWCD education coordinator Jenny Ridenour, Wehrung, Valerie Hamm, and Rose.